This post is brought to you in collaboration with Toyota, as part of my participation in the #SiennaDiaries blogger program, all opinions are my own. I have a lot of experience with being on the road with kids, more than most in fact. I mean, just last summer I spent 50 consecutive days in a van with 4 boys driving more than 7,000 miles across the country, so I know road trips. I didn't however know what it felt like to have a silent car and peace and quiet on a road trip. Until last weekend that is. We settled in for a 7 hour drive out to Louisiana for Family Gras, and I was expecting the usual loud boys, whining, and arguing about who touched who etc. What I heard though were quiet, content boys who happily watched movies almost the whole way there. 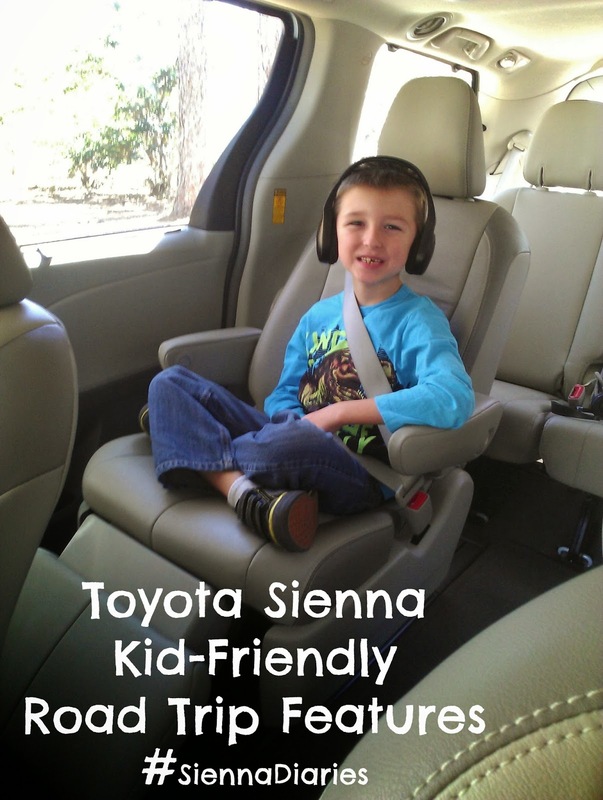 What makes the 2014 Toyota Sienna such a great road trip vehicle for kids? Well, I could go on and on about all the features that make it a great road trip vehicle for adults, but when it comes to features for kids, I thought it best to let the one of the boys show you themselves. In the short video below, my oldest son Joshua takes you on a tour of the great kid friendly features the Toyota Sienna has to offer! Pretty awesome huh? Makes me wish I could be a passenger in the Sienna instead of the driver. Who wouldn't want to slap on a pair of those wireless headphones, block out the outside noise and enjoy a movie while heading out to somewhere new? How does your family get comfy on road trips? I'd want to be a passenger there too! So comfy! Very nice! Looks so comfy for the passengers. I'm so glad you had some peace and quiet without having to punish someone to get it :P Being the passenger in a Sienna is definitely a nice position to be in! I would LOVE to take that on a road trip! We're definitely going to need a bigger vehicle for our next road trip, our little sedan with two kids isn't cutting it. We do go one a few road trips. I wish our car was a bit bigger. Those captain seats in the second row look so comfortable! I think it's great for kids to have 'on board' entertainment on road trips, back in the day we had to buy one of the first portable DVD players to accomplish this, and it set us back a pretty penny. Built in is the way to go! We're going on a mini road trip next month and this would be perfect. Sadly, we'll probably have to take our little car, bummer. I really wish we had one! So much more space for the family. Modern technology is amazing, isn't it! Not sure how my parents did it when me and my brother were younger.